This is a breadcrumb navigation to take you back to previous pages.Maine Memory Network > Scarborough: They Called It Owascoag > Explore the Exhibits > Scarborough Marsh: "Land of Much Grass"
Salt marshes began to form many thousands of years ago when glaciers from the last ice age receded as the climate warmed. Silt from rivers and streams washed into low-lying, protected tidal estuaries and began to build up. 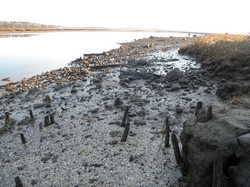 Various organisms, plant life and marine animals were attracted to the resulting mudflats and seed from salt-tolerant grasses took root and began to spread. 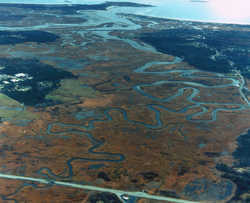 Thus began the growth and development of the marsh we know today. Life in a salt marsh depends upon the grass. Through photosynthesis the Spartina grasses (known variously as cordgrass, salt hay, marsh grass, or salt meadow grass) convert the energy of the sun into usable food for the many creatures in the marsh. As the grasses decay, the rotted material forms a nutrient-rich “soup” that feeds the plankton, clams, mussels, worms and some fish. These creatures in turn feed larger animals such as raccoons, striped bass and ospreys. 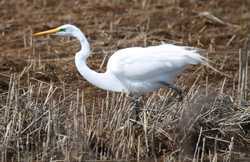 Waste from animals living and dying enters the marsh to be recycled as fertilizer for bacteria and plants. In its twice-daily movement, the tide sweeps nutrient-rich water into the ocean and feeds offshore fish and their young. Additionally, the grass plants provide temperature and humidity control among their stems and act as a buffer against wind and currents.